Can You Like a City And Not Like Its People? Guayaquil is a gritty, sticky, smelly and crowded place with more homeless than I’ve seen elsewhere since I’ve been in South America. The weather is dismal: hot, humid, with mostly still, dank air and a breeze only rarely. When you think of the tropics and your thoughts are not kind, Guayaquil (“Gwhy-a-Kill”) could at least be a placeholder for your archetype. But I really like this city. In the city center, where my seedy hostel is located, there are buildings more than one hundred years old (and occasionally double that age) and beautifully preserved, sprinkled liberally throughout the barrios. 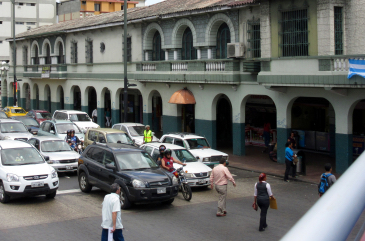 One revitalized barrio, Las Peñas, is a multi-colored maze of old houses, tiendas, boutiques, and restaurants seductively climbing up a hill overlooking the Guayas River. The showpiece of Guayaquil, the Malecon was a rundown and crime-ridden slum along the waterfront less than 2 dozen years ago. Now, after millions of dollars of makeover, it is a 2.5km long, pleasant and picturesque place to stroll. These most recent days it is even more active, for along with the rest of the city center, the workers along the Malecon are preparing for Pope Francis, who will visit Guayaquil in less than one week’s time. There are banners and bunting all over this part of the city, with multi-storey’s tall pictures of the Pope and his quotes adorning many of the big buildings near and even on the grand cathedral. Of course even though he is not expected to generate the excitement here that will come when he chews coca leaves with Bolivia’s President Morales later this month, nevertheless one can feel the emotion and pride brewing locally. And with the power-washing machines blasting away mold and mildew from many of the larger buildings, this part of the city is looking pretty fine, thank you very much. 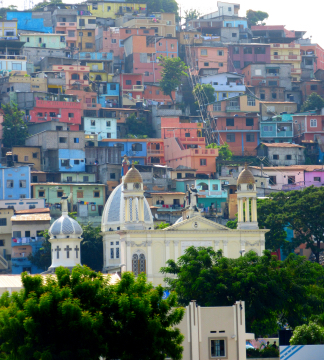 The sad part is that the day after the Pope has come and gone, Guayaquil will revert back to being an also-ran in the Pantheon of must-see South American destinations. But why? Each year the Galapagos Islands compete with Machu Picchu as the most visited place in all of South America. And each year tourists drop half a billion dollars on the islands. And no matter what people think or how they book their cruises, you only get to the islands via Guayaquil, period. You may think that you’re going to visit the islands via the capital, Quito, but you will fly here nevertheless. Half a billion dollars to a developing country is some serious cash. 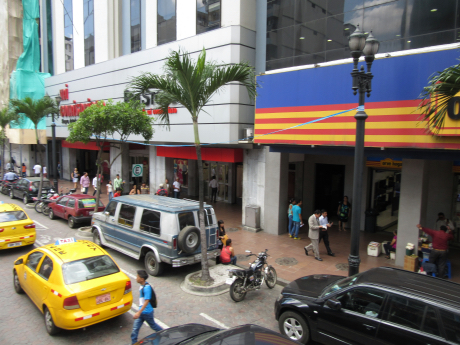 Yet this, the largest of Ecuadorian cities has effectively no tourism infrastructure. I just came from 2 weeks in Otavalo, an indigenous city of about 90,000 people, roughly 1/30 of the size of Guayaquil, and yet every restaurant that I visited, and that was about a dozen in the time that I was there, had wireless internet. But here in the city center? Nothing! I can get an advertised 1/2hr free along the Malecon (though they cut you off after barely 20 minutes! ), and I can get it at the Ecuadorian version of Starbonks, called “Sweet & Coffee” but that’s it. What’s up with that, City? Perhaps it was a cost-cutting measure, but the city now only has a single tourist information office. After visiting 3 times, I believe that I’ve had more than enough. The only person I get to talk to may as well be a robot; in fact, I wish that she was fully automated so I wouldn’t have to fake being courteous. She’s only capable (or perhaps only willing) to talk about the Malecon, the high-end hotels, or the shopping malls. When I asked her, during my final time about a good restaurant with comida tipica, or regional food, she could only talk about fast-food places. I repeated several times that I wanted neither fast food nor fried or greasy food. But she only could talk about the same thing, over and over an over. When I asked about a restaurant that had wi-fi, she just looked and said nothing. When I repeated my questions, she took out a phone book, turned to the restaurant pages and showed me the listings. I again repeated my questions and she had no idea what to say, she could only point. This is not what a tourist office is, I’ve been to ones in cities that care. I’ve been to ones in cities that realize the value to city coffers that tourists bring. Guayaquil is not that city. And that’s the problem: this city doesn’t care. They have an alcalde, a mayor, who’s been in office more than 15 years and he needs to go. His name is plastered over every surface imaginable, and yet he has no clue about how badly he is harming this city. The central government of Ecuador is spending great sums of money promoting the country world-wide as a tourist destination, but the guy running the country’s largest city is clueless. He really, really needs to go. When you read online travel forums you see that the main message about Guayaquil is to spend as little time as possible on the way to the Galapagos; get in, get out, and get going. This is an outrage and it is a message that should have been countered years ago. It is a message that is thoughtlessly hurting the city when instead this could be a place where people actually look forward to spending some extra days. Virtually every other part of this fascinating country has a great tourism infrastructure, but not here. What a sad state of affairs for a situation that doesn’t need to exist. Who is running this place anyway? But as I say, I do like the city. Today I took a double-decker bus tour (there are 2 different tour companies, but the first one I went to, 4 separate times (and right there on the Malecon), never seems to actually have a bus that operates. Yet I had a great time with the company that actually does have a working bus, even when the driver backed into a tree heading out from the ticket office and smashed the glass window inches from my head. Well, I quickly changed seats and spent the rest of the trip cautiously ducking as he passed a bit too close to many power lines, light posts and other tree branches. In spite of his driving though, the bus ride was very interesting. Because of the heat and the equatorial sun, the architecture in Guayaquil has retained an interesting element of sameness. The old buildings still standing are of an identical nature that builds the second and successive storeys above it out over the ground floors; every building has this feature. It’s more than a portico, since the actual floor space above the ground floor extends outward rather than just providing a roofed overhang. And it’s not cantilevered, since there are columns to support those higher floors. This design helps pedestrians escape the direct sun and the plan works so well that the newer buildings have adapted accordingly and integrate the same design. These newer structures aren’t nearly as attractive as the old ones, but they do provide us walkers with an escape route from the killer sun. My sincere thanks to the architects who refuse to fix what ain’t broke. I really do like this place, just not the way that it’s run. Or the people that run it. This entry was posted in Uncategorized and tagged Guayaquil on 2015-07-02 by kmalivuk. Fascinating experiences, Karl. Really enjoying reading. Thank you Dear! Always a blast posting them, even when I’m living in a conflicted zone. Tomorrow and the next and then I’m gone from here (leaving the day the Pope arrives, this town ain’t big enough for the 2 of us!) and back up into the mountains for 3 weeks. Then over to the Amazon for a month, out to the Islas de Los Galapagos for another month, then down to a new country called Perú. And you? 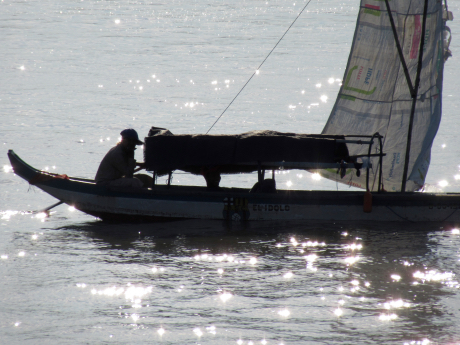 Las Penas is certainly picturesque and the picture of the boat and man on the River Guayas captured the moment. This is the first time you have mentioned the homeless. Are they as prevalent in Guayaquil as they are here in Honolulu? Very strange. It’s your e-mail name, cemalivuk, but it’s listed under my unm e-mail address. Don’t know why. But no, there are far more homeless in Honolulu, the land of the free and home of the homeless. I was out on the “Henry Morgan” and the fisherman was backlit by the late afternoon sun. Timing was just right, but I had no idea that the diamonds would show up until I downloaded the image. I was hoping for some drama and the sun cooperated. It takes 444 steps up the Las Peñas neighborhood to reach a lighthouse. It’s a very picturesque walk. Except for the base of the barrio, there are no roads, only the steps. Amazing about the steps. So all the people who live there go up and down many flights of steps to go to work, to school, to church, to go shopping, to bring home their food, haul their belongings up and down. Amazing! Even more curious: now you are back to “Cindy” without my photo attached. Yes, no roads, all the homes and shops have to carry every single item through this maze of steps; no slackers in Las Peñas, especially the ones living at the very top!